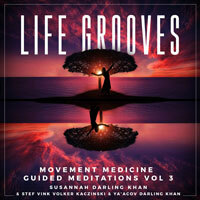 These guided movement meditations have been made to support you to bring the intelligence, freedom and creativity of the unique dancer you are to your daily life. Attune to your purpose, wake up your vitality, release what needs releasing, and MOVE! My mega-thanks to Volker and Stef for the joy and power of this work together, you are such comrades. And Ya’Acov, love of my life and fellow drummer in the drums of eternity, words cannot express my gratitude and love. And to the listener: The prayer of this work is to support more conscious, embodied joy in the dance of your life. May these drums and this music and these practices support your courage to follow, step by step, the integrity of your own being.